In the past, resources that allow practitioners to accurately account for thermal bridging have been limited. The BETB Guide will help you more accurately design building envelopes to current energy standards. On January 1, 2015, the City of Vancouver will require that all envelope assembly details representing at least 1% of the total envelope area be analyzed, up from 5% in the old regulations. The BETB Guide provides a catalogue of the thermal performance of more than 230 envelope assembly details commonly used in this province for buildings of all types and provides ideas for how they can be enhanced to minimize thermal bridging. In the new year, the City of Vancouver will also require a building’s effective R-value before granting a building permit. The BETB Guide will help you determine the R-value more easily (saving both time and money) than ever before. As building energy codes and standards become more stringent, new building owners expect more energy efficiency, comfort, air quality and durability for their buildings. More stringent standards may also expose architects to increased liability. The BETB Guide will help you deliver what building owners want, and help protect you from unnecessary risk. Available online from BC Hydro, the BETB Guide is the result of more than four years of work by engineering firm Morrison Hershfield in collaboration with primary funding partners BC Hydro Power Smart and the Homeowner Protection Office of BC, a division of BC Housing. Other partners include the Canadian Wood Council, FortisBC and FPInnovations. Several changes are coming to the BC Building Code on December 19, 2014. There are a number of resources available to help Code users understand these changes, who they impact, and how to comply with the new requirements. Some of these changes amend existing sections of the Code, while others introduce new content and concepts. B14-02 What’s New? – A bulletin summarizing the most recent changes to the Code, with references to other bulletins and resources. B14-03 Miscellaneous Changes – This bulletin addresses many of the minor recent revisions to the 2012 BC Building Code, including updated standards, errata, and clarified intent of some requirements. B14-04 Daycare Facilities – This bulletin outlines recent changes to Daycare requirements as well as clarifying the intended application of existing requirements. B14-05 9.32. Ventilation – This bulletin provides an overview of the significantly updated ventilation requirements for residential dwelling units, such as houses and apartments. In addition to the Minister’s Order available on our website, a formatted version of the new 9.32 text and appendix notes can be seen here: See 9.32. Ventilation – December 2014, and Appendix-9.32. December 2014. B14–06 Thermal Performance of ‘Rainscreen’ Assemblies – This bulletin outlines how to calculate the thermal performance of wall assemblies that include a capillary break, also known as a ‘rainscreen’ assembly. The new Section 9.36. requires builders to calculate the performance of all parts of the building, and this bulletin provides information required to complete this calculation for ‘rainscreen’ assemblies. B14-07 Radon – This bulletin provides an overview of the updated requirements in the BC Building Code related to soil gases, such as radon, which is a known hazard in communities east of the Coastal mountain range. All technical bulletins and new Code requirements will be posted to the Building and Safety Standards Branch website in the near future. Please note that effective January 1st, 2015, all drawing sets for building projects subject to ASHRAE 90.1 or NECB are required to include Energy Statements per Bulletin 2014-004-BU. The energy webpage has been updated to include a description with a download of an easy-to-use tool to generate the energy statements needed for either an ASHRAE 90.1 project or an NECB project. Please see the Energy Statement tool for ASHRAE projects document for further information. *** Please note: Although the requirement is not mandatory until January 1, 2015, the City of Vancouver encourages and appreciates the immediate implementation of adding these statements to drawings on projects presently going through the building permit process. As part of the City of Vancouver’s Green City Action Plan to reduce building energy usage and GHG emissions, the City is looking at a comprehensive approach to building energy, starting with the design of new construction and continuing over a building’s life by preparing for future renovations that, effective January 1, 2015 with the new Building Bylaw, will require some form of energy-related upgrade or assessment. In order to make this process as smooth as possible, the City will require energy “statements” on design drawings that in future will become archive drawings, referenced by future design teams. The purpose of this process is to provide a simple yet accurate way of determining the energy design criteria used in a building’s original design, and subsequent upgrades. These energy statements will provide a foundation upon which future design teams can assess building performance and determine the most effective approach to achieve their energy upgrade goals. Vancouver is home to some of the most innovative urban design and architecture, not only in Canada but around the world. 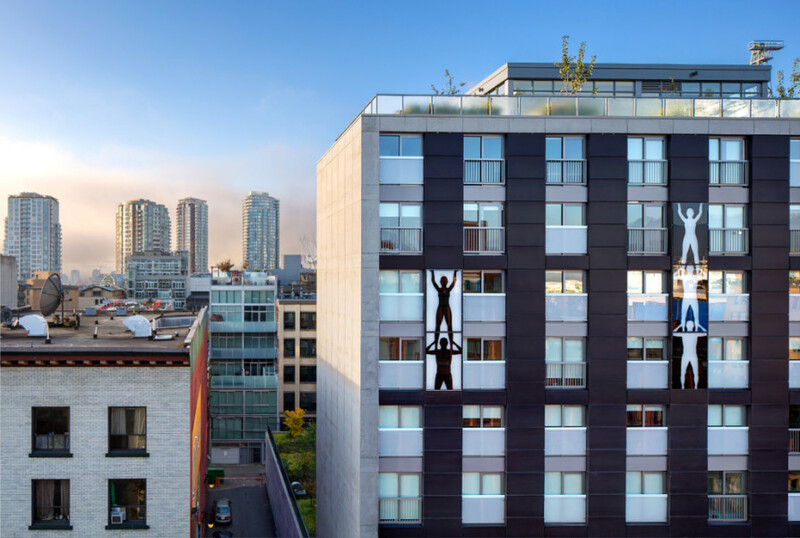 In recognition of the visionary thinking Vancouver is home to, the City has introduced The Urban Design Awards – a biennial celebration of the best in urban design excellence. This year’s inaugural winners competed in nine different categories with the victors being selected by architectural experts Peter Wreglesworth, David Dove, Greg Bellerby and Joseph Fry. Each project faced challenges in their development, from noise pollution due to nearby off-ramps to maintaining sustainable construction, but they all managed to not only overcome those difficulties, but to also create some of the most eye-catching and avant-garde architecture Vancouver has to offer. After over five years at the helm of the AIBC as executive director, Michael Ernest Architect AIBC announced he will be leaving his position effective no earlier than October 31, 2014 and no later than January 31, 2015. The announcement, made at this year’s annual meeting, was met with thunderous applause in recognition of Mike’s outstanding contribution, passion and dedication. Mike has been a part of the fabric of the AIBC and the British Columbia architectural community at large since the 1970s. He has filled numerous roles during his long-standing commitment to the profession: registered architect, principal, oral reviewer, committee member, councilor, council vice-president, registrar, adjunct professor, director of professional practice, CCDC chairman and executive director, to name but a few. With his thoughtful approach and collaborative style of leadership, the AIBC is in an ideal position as it forges ahead during these exciting times. We are grateful for his dedicated service. Mike is fully supportive of a smooth handoff of operational matters. The AIBC Council through its Operational Constraints Committee will oversee the transition. AIBC registrants are invited to celebrate Mike’s career at the AIBC at a reception in his honour to be held during the AIBC Annual Conference Shifting Perspectives. The reception will be followed by a showing of the film If You Build It. Date: Thursday, October 9, 5pm – 7pm. Climb aboard for an exclusive guided tour of some of Vancouver’s WW1 commemorative places. Isaac Vanderhorst, historian and Heritage Vancouver Board member, will fascinate you with stories of WW1 memorials such as the Japanese War Memorial in Stanley Park, the historic lights on the Burrard Street Bridge, the Angel of Mercy, the Cenotaph, South Memorial Park to name but a few. Tour takes place Saturday, November 1, 2014 from 1:00 pm to 5:00 pm. Meet at Vancouver Women’s Hospital (4500 Oak St, Vancouver, BC). Heritage Vancouver members $30; Non-members $35. To register click here. Join the Heritage Vancouver Society for unique opportunity for a tour inside the drill hall and the regimental museum with archivist Colonel Keith Maxwell, and Honorary Major Cameron Cathcart, on an evening when the British Columbia Regiment is training there. With two large castle-like turrets complete with battlements, the Beatty Street Drill has long been a Vancouver landmark and is listed as a class-A heritage building. The Drill Hall is the oldest building in downtown Vancouver that still retains its original use. Tour takes place on Wednesday, October 8th, 2014 from 6:30 pm – 8:30 pm, at 620 Beatty St, Vancouver, BC. Heritage Vancouver members $15; Non-members $20. To register click here. Heritage Vancouver welcomes Brian Jackson, General Manager, Planning and Development Services for the City of Vancouver for their annual heritage review. Discussion will include heritage priorities for 2014 and the future of heritage in Vancouver. Heritage Vancouver works closely with the City of Vancouver to find solutions for the conservation of our heritage structures. Discussions over the past year have included the Heritage Action Plan, the Vancouver Building Bylaw, Heritage Schools, the Hollywood Theatre, First Shaughnessy, the demolition of the Legg House, and Heritage as part of the neighbourhood plans. This event takes place on September 29, 2014 from 7:00 pm to 9:00 pm at Vancouver City Hall (453 West 12th Ave, Vancouver, BC). $10 admission. Space is limited, click here to reserve a seat. Heritage Vancouver Society and the VanDusen Botanical Garden Association invite you to join Park Board Commissioner, John Coupar and VanDusen Botanical Garden Governor, Vicky Earle on September 27, 2014 for a tour of the Conservatory and Gardens at Queen Elizabeth Park. Find out about the history of the park and conservatory, the techniques being used to restore the roof and life of the plants and birds that call Bloedel home. Tickets are $20 and include entrance fee to the Conservatory. To register click here. Join tour guide, Issac Vanderhorst and explore the old community of South Hill, a typical working class Canadian town of 100 years ago where everyone was directly affected by the war. Imagine what life was like as you walk by the houses of the young soldiers and their fathers who worked in the ship building plant, Southill Elementary School, home to rallies and cadets, and the Soldier’s Centre, a drop in for soldiers and a hub for the women’s fundraising efforts. The tour takes place October 5, 2014 and starts at 10:00 am at South Memorial Park Cenotaph (5955 Ross St, Vancouver, BC) and ends at 12:00 noon at the Mountainview Cemetery (5455 Fraser St, Vancouver, BC). Heritage Vancouver members $10; Non-members $15. To register click here. Interested in upgrading your sustainability qualifications and differentiating yourself to perspective employers in design, construction and building management? The LEED Green Associate (GA) designation is one of the most recognized credentials in the industry. This one-day, intensive workshop covers the material you need to know for the LEED v4 credential exam, as well as study techniques and test-taking strategies. Workshop takes place at the UBC Point Grey campus on Saturday, September 27 and Friday, November 21 from 9:00 am to 4:30 pm. Cost $295. For more information or to register, contact Cynthia Tam at cynthia.tam@ubc.ca or visit www.cstudies.ubc.ca/leed. Join the Vancouver Heritage Society for a historic commemoration of the 75th anniversary of the unveiling of the Frances Willard Plaque in Stanley Park. The plaque commemorates the 100th birthday of Frances Elizabeth Willard, founder of the World Women’s Christian Temperance Union, the organization that led the campaign for women winning the vote in many countries. Historian Chris Hay will discuss the historic importance of the plaque and events to BC women winning the vote. Following the event, join Donald Luxton, past-President of Heritage Vancouver, for a lively and informative walking tour of some of the monuments in Stanley Park, including the Japanese Canadian War Memorial, which is currently under restoration. To register for this event, click here. Attend Fenestration West 2014 for one-day of intensive networking and education. By attending, you’ll meet industry veterans and newcomers, gain valuable industry insight, and you are eligible for AIBC Core Learning Units. Fenestration West 2014 sessions include: Aluminum Extrusions as Building Materials; Powder Coatings – A Sustainable Choice; December 2014 – Code Energy Provisions, and; Acoustic Testing at the Laboratory. Taking place on October 23, 2014 at the Sheraton Guildford (15269 – 104 Avenue Surrey, BC) starting at 8:00am to 4:00pm. For more details, registration and contact information, please visit The Fenestration Association of BC. The Vancouver Island AIBC Chapter’s next Lunch and Learn is on October 29, 2014 from 12:00 pm to 1:15 pm. The topic is “Large Passive House Buildings in Canada” and will compare larger buildings to small residential buildings examining: the form, orientation, quality components, insulation, high efficiency HRV, and detailed building models; energy efficiency and air quality; design requirements and implications; and will conclude with various case studies. This Lunch and Learn will be provided free of charge, however those interested in attending are to contact Don Lovell Architect AIBC, at donwlovell@gmail.com to reserve a spot. For any questions relating to this event, please contact Don at the email provided. REP Event Providers: We are aware that some organizations are misrepresenting themselves as part of the AIBC Registered Educational Provider (REP) program. In some cases this has caused compliance problems for CES Participants. As a gentle reminder to our members, please make sure that you look for the AIBC CES logo when attending seminars, workshops and other educational events which may advertise that they are eligible for learning units. If you don’t see the AIBC CES logo and attendance sheet, you will need to self-report the event. Self-Reporting: Learning units for any legitimate REP-approved event will be entered for you. If the event is not approved and you wish to obtain LUs for your attendance and participation, you are required to self-report your LUs. Verify your Records: If you are unsure if an event is approved, please ask the instructor/presenter of the event. Finally as a follow up, after each event, please make sure you check your record to ensure that your learning activity is properly entered and received. Thank you for your attention. We are working hard to ensure all CES participants have the tools and the knowledge to be CES compliant.